It's easy to forget that the Trump rally started with palpable fear on Wall Street. 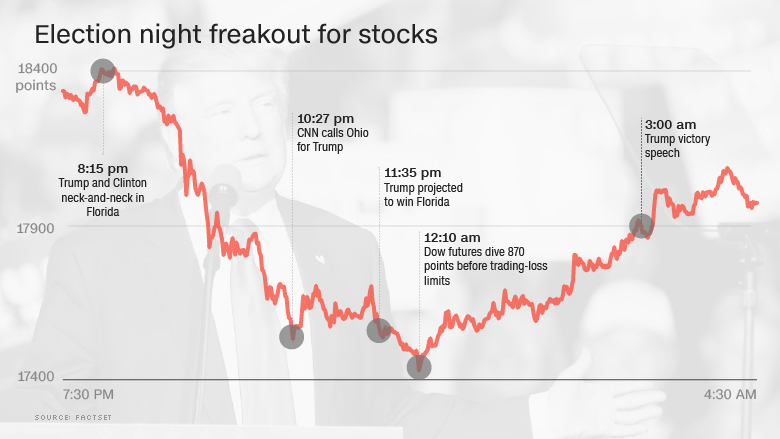 Exactly one year ago, Donald Trump's shocking performance on election night sent shudders through global markets. Dow futures crashed by nearly 900 points as investors fretted about Trump's volatility and scary campaign promises on trade and immigration. "It was fear and panic that night," said Wade Balliet, chief investment strategist at Bank of the West. But the market freakout vanished by morning, and stocks started the Trump era on a decidedly optimistic note. "People quickly decided maybe it's not doomsday. Maybe it's an opportunity," Balliet said. It turned out to be an historic opportunity. 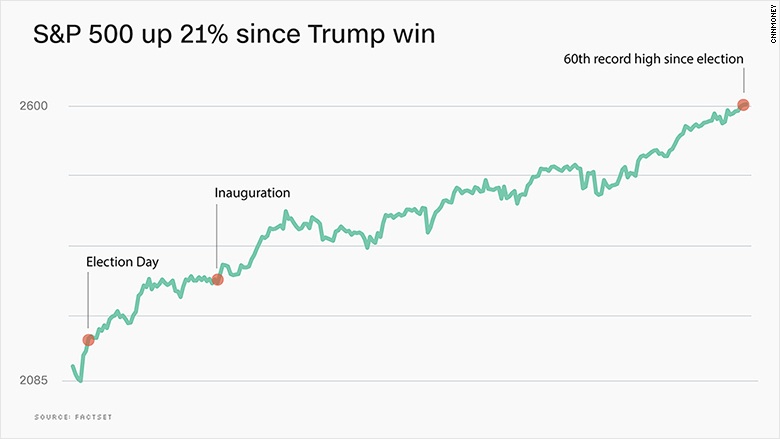 The S&P 500 has soared 21% since the close of trading on Election Day 2016. That's the third-best performance during a president's first year since World War II, behind only President George H. W. Bush and President John F. Kennedy, according to Sam Stovall of CFRA Research. The stock market also hit a record number of records under Trump. The S&P 500's 60 all-time highs since the election is unmatched during a president's first year in office, according to CFRA. That achievement underscores the fact that Trump inherited a stock market near all-time highs and an economy that was in solid shape. It also highlights how remarkably tranquil the rally has been. Sharp drops and steep gains have been rare. Unlike most of his predecessors, Trump frequently brags about Wall Street's post-election rise. It's a tactic that could backfire should stocks tumble, as they've been known to do at times. Trump went a step further by recently appearing to take full credit for the market's climb. "The reason our stock market is so successful is because of me," he told reporters on Air Force One on Monday. Trump, who has filed for several business bankruptcies, added, "I've always been great with money, I've always been great with jobs, that's what I do." It's true that the initial party on Wall Street was driven by optimism about Trump's pro-business promises: slashing corporate taxes, ripping up regulation and ramping up infrastructure spending. But that wasn't the only driver. Stocks continued to rise, even as Trump's legislative agenda stalled, thanks to impressive corporate profits and a strengthening economy at home and abroad. In a recent survey by E*Trade, 61% of investors listed the improving U.S. economy as a factor driving the bull market in stocks. Just 32% gave credit to Trump and his administration. Some even think that if Trump lost, we could be talking about the Hillary rally right now, thanks to a goldilocks backdrop of low unemployment and even lower interest rates. "Regardless of if it was Clinton or Trump, we would be looking at similar market performance this year," said Balliet. Instead of tax cuts, he said Wall Street would be focused on infrastructure spending under Clinton. But the real question is: Where do stocks go from here? The economy and corporate profits will need to continue growing at a healthy clip to justify how pricey stocks have gotten. The S&P 500 has rarely been as expensive as it is right now, according to Goldman Sachs. JPMorgan Chase predicted this week that the S&P 500 will barely rise at all next year -- just 3.3% -- due to these lofty valuations. For now, Wall Street will obsessively focus on the fate of the GOP tax overhaul. Failure would likely disappoint investors, potentially sparking a rare selloff. If Trump succeeds in getting "massive" tax cuts, the stock market may celebrate. Of course, it's an open question whether the U.S. economy really needs huge tax cuts right now. Unemployment is sitting at just 4.1%, after all. The risk is that adding expensive medicine to an already-healthy economy overheats the stock market. Goldman Sachs CEO Lloyd Blankfein recently told Bloomberg News now isn't the time for fiscal stimulus, while Morgan Stanley warned that Trump tax cuts could create a "boom then bust." Omar Aguilar, Charles Schwab's chief investment officer for equities, doesn't think next year's ride will be as smooth for investors. "We still believe the market can extend its rally. But we do not think it's going to be a straight line. Volatility will come back," he said.